What does a 911 Restoration Franchise Cost? Make the World a Better Place with a 911 Restoration Franchise. 911 Restoration is a nationally trusted brand with presence all across the U.S. and in Canada. With customers in high-demand, we are always looking to grow with those that want more than just a business opportunity but those that want to be connected to an organization that creates a better future for all. Our mission is to build a fresh start culture, providing everyone with the highest customer experience that they deserve. We deliver 365/24/7 emergency assistance specializing in water damage restoration, mold remediation, and fire damage restoration. Open 911 Restoration in any of these available states: AL, AK, AZ, AR, HI, ID, IN, IA, KY, LA, ME, MD, MI, MN, MS, MO, MT, NE, NV, NJ, NM, NC, ND, OH, OK, OR, PA, RI, SC, SD, TX, UT, VT, WA, WI. A restoration business is recession proof and generates 10 times the profits of another type of business. Natural disasters and climate instability have created an environment where the world needs restoration businesses like never before. 911 Restoration has been growing the brand since 2003 and knows how to connect with customers in need. Make the choice to maximize your time and money and join our 911 Restoration family in building a brand that makes the world a better place. When you join the 911 family, whether you are new to the industry or an established mom n’ pop shop, we will customize your training and tools to guide you every step of the way. We provide our franchisees with everything you need to be successful right now. Do you want to create a better future for all? 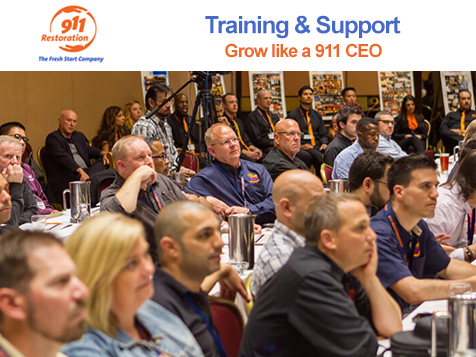 Grow a meaningful business with 911 Restoration. Want to know what you need in order to start your cleaning business with 911 Restoration?